The Donors page of the Give admin area provides useful information about donors. The main Donors page shows you all of the donors to the site with links to click for more information. 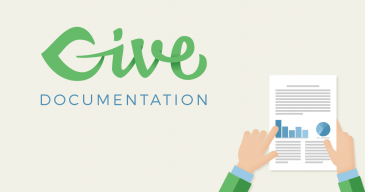 Use the links below to learn more about managing Donors in your Give-powered site. 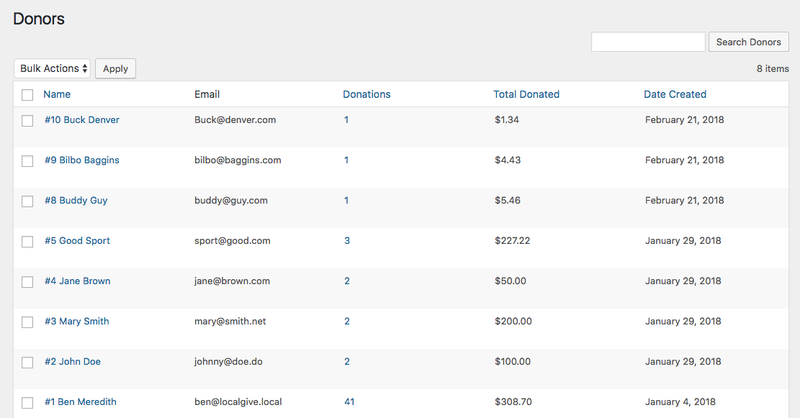 The Donors page of the Give backend provides an overview of all donors on the site, with options to drill down to specific donors, or sort donors in a specific way. Name — This column lists the Donor ID number and Donor Name. Hovering over the row displays options to view the donor, view or modify the notes for the donor, or delete the donor. Clicking on either the name/ID or “View Donor” takes you to the same place: the individual donor’s settings page. By default, the Donor table is sorted by donor ID number. Clicking the column header will toggle between ordering by ascending or descending alphabetical order based on the donor’s first name. Email — This column lists the donor’s email. Donations — This column lists the number of donations the donor has made. You can sort the table by this number by clicking the column header. Total Donated — This column lists the total amount donated by the donor. You can sort the table by this amount by clicking the column header. Date Created — This column lists the date the donor was created (first donation date). You can sort the table by this column by clicking the column header.